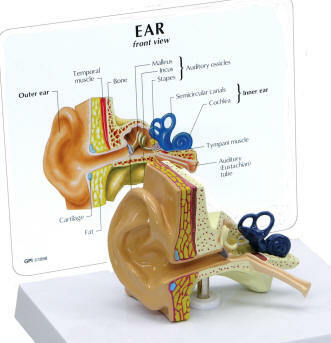 Full size normal model shows semi-circular canals and cochlea of the inner ear, auditory ossicles from the middle ear, tympanic membrane and temporal and tympani muscles. Education card and base included with model. One and one half times the size of a Child\'s Ear. 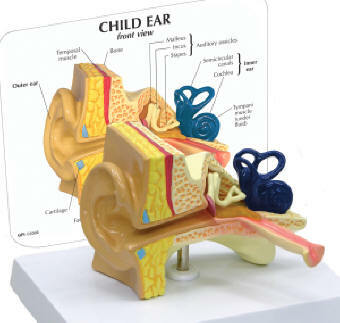 Illustrating semi-circular canals and cochlea of the inner ear; auditory ossicles, otitis media (inflammation and simulated fluid in the middle ear); tympanic membrane and temporal and tympani muslces; the model also presents a horizontal eustachian tube typical of a child. Education card and base included with model. 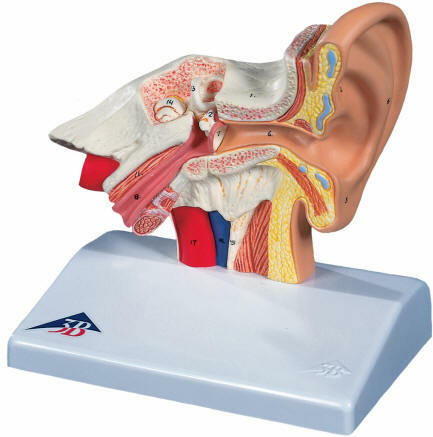 1.5 times life-size anatomical model provides accurate representation of the outer, middle and inner ear. The human auditory ossicles, individually presented in natural position, embedded in transparent acrylic. 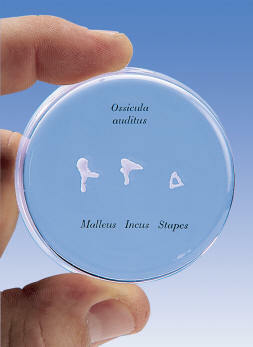 This life size auditory ossicles are cast from natural specimen.